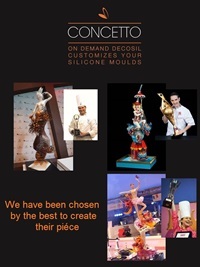 LINEAGUSCIO® is the line of food grade contact 3D silicone molds conceived by Stefano Laghi, produced and patented by decosi, dedicated to confectiones, chocolatiers and ice cream makers. It allows you to quickly create original chocolate Easter eggs, chocolate Christmas Trees, chocolate Spheres, chocolate Bells and many other objects. Christmas Sphere chocolate molds, Christmas Bell chocolate molds and Christmas Tree chocolate molds, Easter Egg chocolate molds and Easter Bell Chocolate molds, Souvenir Chocolate molds.